For each project schedule file you create, Project 2013 essentially builds an extensive database of information. The different tabs and views in Project 2013 enable you to zero in on different combinations of the data you need. Having several views from which to observe your project information is helpful, but having all those views does you no good if you don’t know how to move around in a view after you find it or how to move from one to another. One way to move from one view to another is by using the Task tab on the Ribbon. Clicking the bottom section (with the down arrow) of the Gantt Chart button to the left of the Task tab displays a menu of Project’s most-often-used views, as well as any custom views you create. Simply click any listed view to display it. In case it isn’t obvious, clicking the top section of the Gantt Chart button redisplays Gantt Chart view. You can see the same list of views by clicking the View group’s Team Planner drop-down on the Resource tab. Clicking the View tab on the Ribbon gives you all kinds of options for selecting a view. 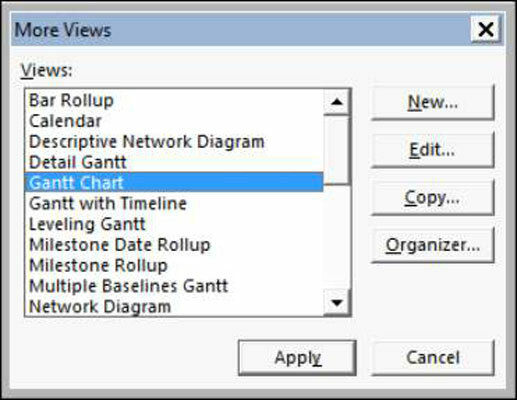 Using the Task Views group on the far left end, you can select the Gantt Chart, Task Usage, Network Diagram, Calendar, Task Sheet, or Timeline view. The Resource Views group enables you to select the Team Planner, Resource Usage, Resource Sheet, or Resource Form view. Other groups on the View tab offer choices for sorting data, changing the timescale, and zooming a view to see it better. You can also split the view by adding the timescale to whichever view is active, or you can add details to a specific view. The lower-right corner of the Project window has buttons for jumping directly to the Gantt Chart, Task Usage, Team Planner, Resource Sheet, and Report Planner views. Select either the Task tab or Resource tab on the Ribbon. Click the bottom part of the Gantt Chart button. Click More Views at the bottom of the menu. The More Views dialog box appears. Use the scroll bar to locate the view you want. Select the view you want and click the Apply button. If you liked the View bar that was available in earlier versions of Project, you can still use it: Right-click the gray bar on the left side of Project, and choose View Bar to display the View bar. To hide it again, right-click the View bar and choose View Bar.